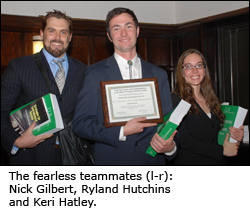 In mid-February, the UNM law school team of Keri Hatley, Ryland Hutchins and Nick Gilbert battled their way to the semi-finals of the National Pace Environmental Law Moot Court Competition before losing to Louisiana State University. They were among 68 teams to participate in the most prestigious annual environmental law competition, held in White Plains, NY. Melissa Kennelly, a 2L, helped with administration duties. "They were smooth, persuasive and fearless," said their proud adviser Professor Eileen Gauna.